MoveOn.org has come in for heavy criticism of its full-page advertisement in the Sept. 10th New York Times, in which the liberal advocacy group suggested General David Petraeus should be known as "General Betray Us". The ad infuriated some of MoveOn's natural allies, Democrats and anti-war Republicans, who claim it rallied wavering Republicans behind President Bush and effectively ended any hope that the Senate might pass legislation speeding up the withdrawal of U.S. troops from Iraq. But the ad, and the reaction to it, was also significant for the way it gave us a preview of what a general election race between Hillary Clinton and Rudy Giuliani might look like. The ad appeared at a convenient moment for the Giuliani campaign. For the first time since the former New York mayor entered the G.O.P. race in early February, his status as his party's front-runner in national polls had begun to slip. The logic against a Giuliani victory  that he's too out of step with the Republican rank and file on social issues to win the nomination  seemed to be taking hold just as Fred Thompson officially entered the race. Giuliani needed to change the dynamic of the campaign, to get G.O.P. primary voters to focus on his general electability against a Democrat rather than his record on specific issues. MoveOn gave Giuliani precisely the distraction he was looking for. Other Republicans railed against the organization's ad, but Giuliani went further. He linked it to Hillary Clinton, calling her criticism of Gen. Petraeus' Senate testimony "political venom" and chastising her for refusing to condemn MoveOn. Then the Giuliani campaign bought its own full-page ad in the Times, praising Petraeus and lacerating MoveOn and Clinton. "Who should America listen to," the ad asked, "a decorated soldier's commitment to defending America, or Hillary Clinton's commitment to defending MoveOn.org?" 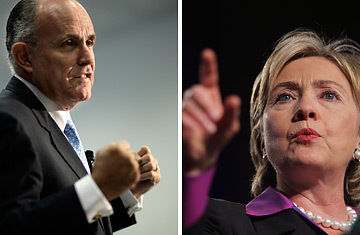 Just like that, the campaign story of the week was Rudy vs. Hillary. Coverage of the rest of the G.O.P. field faded away as the media chronicled Giuliani's attacks on Hillary, MoveOn and liberals in general. "I have to hand it to the Giuliani people; that was a brilliant move," says a Democratic strategist with ties to the Clinton campaign. Giuliani aides and advisers readily concede that the attacks have been designed to stir Republican voters out of their depression and torpor. "About the only thing Republicans agree on right now is Hillary," says one adviser. "They're terrified she might be President, so they love it when they see someone going after her." Asked whether Giuliani was attacking Clinton and MoveOn because he'd rather be talking about the enemy than explaining his record on social issues, an aide concedes, "That goes without saying." Yet the spat does no obvious harm to Senator Clinton either, and for similar reasons. By highlighting her critique of the Petraeus testimony, Giuliani has helped Clinton with the segment of the Democratic electorate that is most suspicious of her because of her 2002 vote authorizing force in Iraq (and because of her refusal to call that vote a mistake). For good measure, on Thursday Clinton voted "no" on a bill introduced by Republican Sen. John Cornyn of Texas condemning the original MoveOn ad. The bill passed 72-25. President Bush joined in the Giuliani-led bashing of MoveOn on Thursday, saying the organization's ad criticizing Gen. Petraeus was "disgusting." But as MoveOn executive director Eli Pariser is quick to point out, when it comes to Iraq policy, substantially more Americans side with MoveOn's demand that a deadline be set to withdraw troops than support the general and the President. Despite being chastised by Democrats and Republicans alike, even MoveOn has benefited from the commotion by gaining a higher profile than ever before and showing its ability to alter the political debate. After Giuliani's counter-ad in the Times, the organization fired back with a TV spot titled, "Giuliani: A Betrayal of Trust", accusing the former New York mayor of being "AWOL" from the Iraq Study Group when he missed meetings while giving high-paid speeches to corporate clients. (Citing schedule conflicts, Giuliani eventually quit the group without ever attending a meeting. His campaign now says he resigned because he was planning to run for President and didn't want to create a conflict.) "The goal is to demonstrate that the Republican front-runner has an enormous problem when it comes to the big issue facing the country  the war in Iraq," says MoveOn's Pariser. "And since Giuliani chose to insert himself into this story, we thought it was important to get out the fact that he bailed out on the [Iraq Study Group]." If Giuliani wins the G.O.P. nomination, we'll hear a lot more about his failure to serve on the ISG. And if Clinton gets the Democratic nod, we'll see plenty of Republican efforts to label her a lackey of the left wing and MoveOn. And at that point, one side will definitely be on the losing end.